Are Your Kids Sure Christianity Is True? Between the ages of 8 and 12, kids often start to wonder if Christianity is true. In Cold-Case Christianity for Kids, detective J. Warner Wallace draws readers into the thrill of high-stakes investigation by showing them how to think rather than telling them what to think. In this children's companion to the bestselling Cold-Case Christianity, detective Wallace gets kids excited about testing witnesses, examining the evidenece, and investiagting the case for Christianity. Includes author illustrations and links to a website (coldcasechristianityforkids.com) where kids can download activities, fill in case notes, and earn a certificate of merit. J. Warner and Susie Wallace have been training young people in the church setting for over a decade. J. Warner is a cold-case homicide detective who has been featured on Dateline, FOX News, Court TV and other crime related television shows. A former atheist, he is the author of Cold-Case Christianity, God’s Crime Scene, and Forensic Faith. J. Warner has a master’s degree in theological studies, and Susie has a master’s degree in speech pathology. 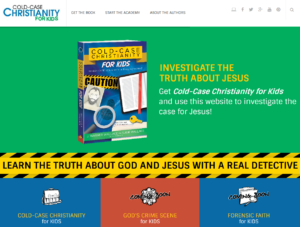 Cold-Case Christianity for Kids includes author illustrations, and is supported by an interactive website that allows kids to download chapter activities and “case note” fill-in sheets. When these are successfully completed and assembled in an “Academy Notebook,” readers will be qualified to earn a Cold-Case Academy “Certificate of Merit.” Plus, Cold-Case Christianity for Kids follows the same chapter sequence as Wallace’s adult book,Cold-Case Christianity, so parents and children can discuss and explore the evidence together, chapter by chapter.